The lie I faced on the seventh green at Costa Navarino was so steep, it's a wonder I didn't need rappelling gear to address the ball. My caddy, who has recommended twisting shots that skip over bunkers and thread between trees, suddenly had no advice. Without any starting point for my read, I had no hope of making this putt in Tiger Woods PGA Tour 12. Of course, I'd have no hope of making this putt in real life, either. Boy, here it comes I thought. This AI is bending me over. When you face a putt with a severe break to the hole, you can count on your caddy completely abandoning you in Tiger Woods PGA Tour 12. As much as some players dislike his shot-calling from the tee and the fairway, I find the caddy's green-reading is absolutely critical. And the game, like clockwork, seems to deprive you of it when your dominance and your tournament scores become more than reality can bear. Putt after painful putt I carded a triple-bogey, not just on this hole but also on the 11th, and the game crashed my shot at the world No. 1 ranking. Only later did I consider the psychology behind those last two sentences. The game did this to me. Name a sport, and in real life I am bad at it, from golf to softball to driveway basketball, and my high school baseball career was a struggle from first game to last. I made tons of excuses for my failures, but to blame the game itself, even its equipment, went too far. Yet if I lip out a four-foot putt in Tiger, or underthrow my receiver in Madden, or miss with ball four in MLB 2K11, somehow, that's on the game, and not me. "That's an AI assist," is the common refrain, and I've said it with conviction. Even as sports games implement more deterministic controls, more realistic ratings and more authentic player performances, little of that translates to the player taking responsibility for success or failure, in singleplayer games anyway. (Online sports multiplayer is a completely different game, one which rarely reflects reality). Regardless of our real-life ability to read a cover-2 defense or the green of No. 17 at Augusta National, we expect to execute against such things successfully in a video game, every time. This is where Madden NFL 12 will walk a tightrope this year. The game is bringing "dynamic player performance" to its persistent modes—franchise, online franchise and "Superstar," its singleplayer career. Basically, it means a player can deviate from his base ratings and be more effective—or worse—on a week-to-week basis. A player's "consistency" rating, and then his in-game successes or failures, are meant to keep the fluctuation from being completely arbitrary. Other sports video games have implemented the same concept. The difference is they (NBA, NHL or Major League Baseball) play 82 or 162 games in a season. In a video game, many of those end up simulated, and the large sample size of available performances means a terrible showing by your superstar hitter in a mid-June game affects about half of one percent of the season. In American football's 16-game season the stakes are 5 to 10 times higher, and Madden's franchise-mode gamers typically play all the year's regular season games themselves. I'm told that a player's hot- or cold-streak will not last more than three games, for purposes of balance. In Madden's singleplayer modes, two straight losses are grounds for all sorts of controller-throwing and dashboard-quitting. Everyone wants high-fidelity realism in sports video games, but if players don't feel like the performance is meaningfully attached to something, they're going to accuse the game of screwing them. Madden 12 will be transparent in how its players ratings' move, showing their mid-game changes in tendencies at the pause menu, and slapping a hot or cold icon by their name in your player management screens. But there's still a calculation behind Oz's curtain. And players are less likely to notice that working in their favor (because who hasn't thrown for 400 yards with Derek Anderson?) than they are against them. Years ago, I had a friend utterly committed to going 16-0 through the season in Madden NFL 2003. As sure as he hit week 14 with no losses, the games got tougher, he swore. "Lost to Chicago in week 15," he'd say, "and that was totally the AI assist." Thing is, that wasn't the case. Guys who worked on that Madden, and others following it, swear to me that there was no AI adjustment if you went undefeated deep into your franchise year. Only in Madden NFL 09 could the game get deliberately tougher in playoff and rivalry matchups, a change abandoned a year later. What's more likely they said, is how a player responds to success that has no analogue in real life. At that point, every opportunity becomes more desperate and every failure becomes more catastrophic. It's a kind of Heisenberg's uncertainty principle, that the act of observing the magnitude of a moment fundamentally alters how it will play out. Again, the developers of sports video games face a more unreasonable expectation than those in any other genre. As a space Marine, you're supposed to save the universe. Even hopelessly outnumbered, you're supposed to win. You're supposed to find the lost ring of something or other and free the land from the clutches of whatever eternal demonic evil. In singleplayer mode, no roleplaying game, no first-person shooter, no video game other than a sports video game moves forward from a decisive loss. You start over. The best sports game experiences are not the wire-to-wire victories. They're the ones where you feel it slipping away, where you trail by two scores late and then pull off the miracle as time runs out. There is only so much a developer can do to deliver a preamble of setbacks without discouragement. Ultimately, it requires the character to play through a disappointment. It's the same requirement of actual sports competition. 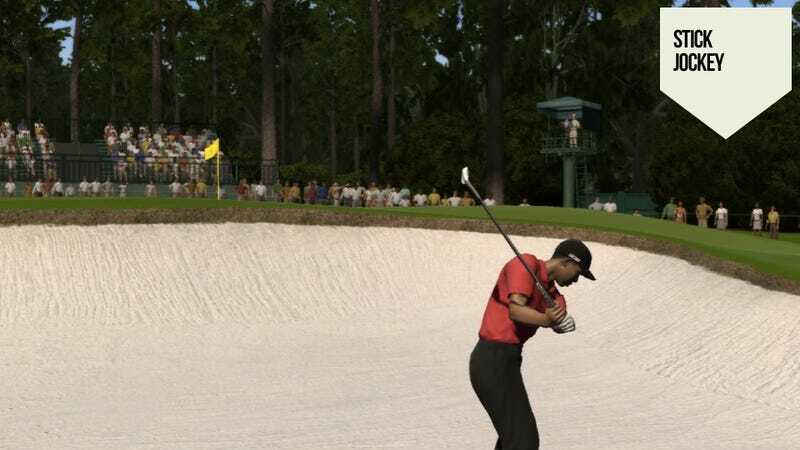 In the final round of The Masters in Tiger Woods PGA Tour 12, paired with Tiger Woods and trailing him by one stroke, my second shot on No. 17 found the bunker. I swore at myself, but I stuck with it. Unbeliveably, I nailed a legend-making wedge shot for birdie. I nearly wept. Woods bogeyed the hole. We both made par on No. 18, and I took my first Green Jacket by a stroke. If the game was rigging results against me behind the scenes at Costa Navarino, then who's to say this fairy-tale ending at Augusta was not also a contrivance? It wasn't. I made that shot. I rose to the occasion. I won in the most thrilling of ways. It is an authentic feeling in a video game for the same reason it is in real life. It is because I took responsibility for my failures, and overcame them.